"""The KUHL W'S JETSTREAM TRENCH is a lightweight, high performance rain jacket made with AIRSKAPE fabric. This waterproof/breathable fabric boasts a 20K waterproof rating, 16K water vapor transportation, and a 2.5 layer 15 micron thick hydrophilic PU laminate with blue pearl finish. KUHL's signature hood has a reinforced brim and clean and sleek eye-lock for low profile adjustment. 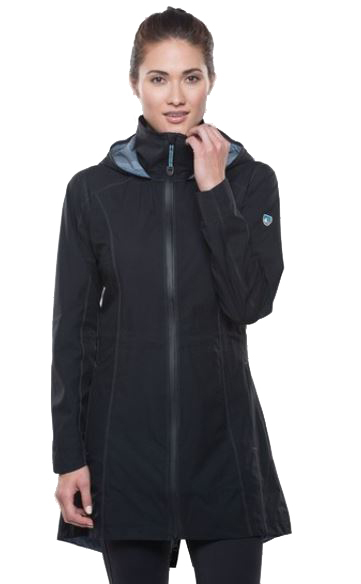 The W'S JETSTREAM TRENCH features a dropped back hem for extra coverage, and the center front zipper falls just above knee (34""""). An internal draw cord adjusts at the waist for a custom fit. Custom KUHL reflective ribbon at the inside draft flap and pockets provides better nighttime visibility.